Baked Lobster Tails – Nothing is as elegant and delicious! This is usually a special occasion meal, but whether you are planning a luxurious evening at home or a casual dinner date, impress your family and friends with a delicious lobster tail dinner. There is always a reason to celebrate when serving lobster tails. Serving lobster tails to your dinner guests or loved ones is always a special treat, so you want them to taste great! Lobster tails are easier to obtain than whole lobsters and easier to prepare. Buying a whole lobster is very expensive, and because most of the meat is found in the claws and in the tail. It is more economical to just buy a quantity of frozen lobster tails rather than the whole lobster itself and make these wonderful cooked Lobster Tails. Saying this, be careful and buy the best product you can afford and buy from a reputable source. Please check out my five-course Baked Lobster Tail dinner menu which includes this fabulous Baked Lobster Tails. Check out my article How To Buy Frozen Lobster Tails and How To Butter-Poached Lobster Tails. * Figure one (1) lobster tail per person. Things to avoid when buying frozen lobster tails: If you see any discoloration, like black spots, in the flesh of the lobster meat, do not purchase, as they were probably not handled properly. Also, if the tail has a grayish color, it is a sign the lobster was not alive during the processing. Defrost (thaw) lobster tails overnight in the refrigerator. The lobster tails may be cooked frozen, but for the best results, defrosted them before cooking. To defrost lobster tails, place them in the refrigerator for a period of approximately 8 to 10 hours or alternatively place them in a bowl of cold water. Check out my article How To Buy Frozen Lobster Tails. When the lobster tails are defrosted, insert point of kitchen shears between the meat and the hard shell. Cut the shell down the center of the back with scissors, leaving tail fan intact. NOTE: Do not remove the under shell. I run my little finger between the meat and the shell to loosen from each other. Lift uncooked tail through the slit to rest on the top of the shell (this is called a piggyback lobster tail). At this stage, the lobster tails may be refrigerated until ready to bake. Cover with plastic wrap to prevent drying out. Place prepared lobster tails on a baking sheet, brush each lobster tail with melted butter, and bake approximately 15 minutes or until an instant-read meat thermometer register and internal temperature of 140 to 145 degrees F. (do not overcook, as the lobster will become tough and rubbery). While cooking, lobster shells will turn their characteristic bright red color well before the meat is thoroughly cooked inside. Remove the perfectly cooked lobster tails from the oven when done. Serve immediately with melted butter and lemon slices. If the lobster tails will not be eaten right away, they must be cooled quickly in ice-water. You can keep cooked lobsters in your refrigerator for 1 to 2 days. The outstanding lobster bisque recipe is from the 1965 cookbook A Treasury of Great Recipes by Mary and Vincent Price. The original recipe came from the Gage and Tollner Restaurant in Brooklyn, New York. This delicious soup is the result of cooking lobster meat in butter and then adding cream. Rich, delicious, and tasting of pure essence of lobster. The lobster meat shines in these wonderful hand-made lobster cakes. Can be served as an appetizer or an entree. I adapted this recipe from Chef Gregory Cornelius of the Crescent Club in Memphis, Tennessee. This is a very decadent macaroni and cheese. Makes a great company dish. Your guests will be blown away! Don’t worry about the calories, as they just slide easily down your stomach! This classic dish has been popular since the mid 1870’s. Also learn about the interesting history and lore of Lobster Newberg. Recipe by Chef Brandon Frohne, an award winning 4th generation Chef and Winery Chef at the acclaimed Chateau an Winery and Resort in Braselton, Ga. The Lobster I bought is 0 .97 Lbs How long I bake it? 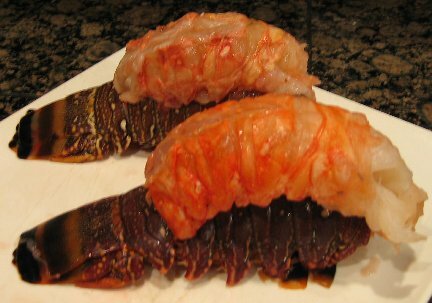 Place prepared lobster tails on a baking sheet, brush each lobster tail with melted butter, and bake approximately 15 minutes or until an instant-read meat thermometer register and internal temperature of 140 to 145 degrees F. (do not overcook, as the lobster will become tough and rubbery). Bake prepared lobster tails until an instant-read meat thermometer register and internal temperature of 140 to 145 degrees F. (do not overcook, as the lobster will become tough and rubbery). While cooking, lobster shells will turn their characteristic bright red color well before the meat is thoroughly cooked inside. So, what I am reading is that, no matter the size of your lobster tail (be it 3 oz or 18 oz) you cook it at 350 for 15 minutes. This is what my recipe says: Bake approximately 15 minutes or until an instant-read meat thermometer register and internal temperature of 140 to 145 degrees F.
Using the internal temperature of food is the only way to determine how long to cook to achieve perfection. How long should it take in the oven for a 16 oz. Tail? Start with 15 minutes and check the internal temperature of the lobster tail. The lobster is perfectly baked when the meat has reached between 140-145 degrees. Continue baking in 5 minutes increments until the lobster has reached the internal temperature in the instructions. Do I bake covered or u covered? The ingredients state they use a 6 oz tail. 6 to 9 ounces is the approximate size of the lobster tails to purchase. I did at 400 because I was roasting asparagus in the same pan. Took lobster out at 12 min. 7oz lobster. Came out great. What makes a baked lobster tail go mushy? This could be a result of freezing, thawing, and refreezing the lobster tail. Lobster was dead before being processed. There is another opinion that lobsters release an enzyme as a defense mechanism. As this only occurs with 2 out of every hundred tails or so, I’m not entirely sure what to think of this theory. I make a slight cut down the middle of the lobster meat I than mix up a little melted butter, bit of lemon juice and a dash of parsley. I brush this over the lobster before I bake on a cookie sheet with a wire rack. Depending on the size of the lobster I bake it 15-20 minutes at 350 degrees. Turns out perfect every time !!! I’m baking 14 4-5 oz tails . Still 15 minutes ?